The Union Hotels, consisting of four hotels located in the very heart of Slovenia’s capital, offers their guests a variety of services. 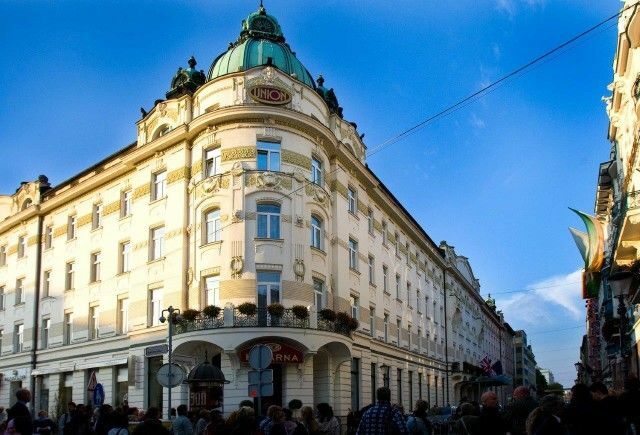 Hotel Lev, The Grand Union Hotel, Grand Hotel Union Business and Central Hotel all together currently offer 596 comfortable and fully furnished rooms, that are a perfect and a relaxing getaway after a long day of sightseeing of Ljubljana’s attractions. The professional Concierge team, offered at the Grand Hotel Union, also the proud members of Les Clefs d’Or, provide the customer service with a passion for excellence. The hotels offer a wide range of services for their guests to serve all of their needs – from wellness treatment to fitness, an outstanding cuisine, conference and congress venues with various set-up possibilities, lively cafes, bars and more. The Grand Union Hotel is the largest conference hotel in the city, with 21 conference halls and meeting rooms, spreading over 3.000m2 with capacity for hosting 10 to 850 participants. They organise all types of events from conferences, receptions, to business meetings of smaller size. The most famous are the Union Hall and the White Hall, which have for a long time had a reputation of hosting unique events, weddings and important international conferences. As a long-term vision of Union Hotels to renew the hotels and bring a richer experience to our guests, Hotel Lev is continuing its transformation journey, which will take place until the end of Spring 2019. The renovation will relate the beginning of Lev’s story from the 60’s – the new visual will fuse the contemporary, timeless elegance with a retro touch. The current renovation, which will include 78 rooms on five floors, will bring an additional 14 rooms, a renovated lobby area and reception area and a new bistro overlooking the lively streets of Ljubljana. The hotel’s breakfast room will also get an extended area and a new look. At the beginning of November 2018, Central Hotel also entered on a path of metamorphosis. The hotel will re-open in Spring 2019 with a fresh and trendy concept, combining stylish design and approachable service, offering its guest 91 rooms. Our hotel will have a vibe, where public areas, check-in area and the open space Living Lounge will be all shared on the 7th floor. The lounge-style lobby or the co-working space will invite all to work, relax and meet.